First of all, how amazing is that cover? It’s gorgeous. I have a lot of feelings about this book. Not all of them good. This book is one of the most difficult I’ve had to review. It’s an incredibly layered and complex read with lyrical, image heavy writing and a moody atmosphere. 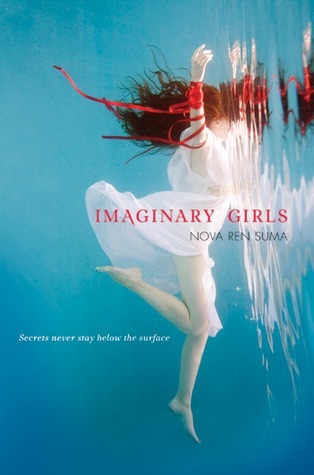 Chloe- Imaginary Girl’s is Chloe’s story, so Suma’s decision to write in first person using her as narrator is a good one. Chloe is an interesting character, she is both jaded and naive. Ruby has been her role model and in many ways her mother, and in many ways Ruby has seen and done it all, she is unimpressed with the world at large and this rubs off on Chloe. Chloe is also a completely unreliable narrator, she is firmly in awe of Ruby and this hero-worship prevents her from seeing her sister, her family, and the rest of the other characters and events clearly. It’s interesting and at times frustrating to read past Chloe’s bias and see the real characters. The story is complex and interesting, defying genre it has elements of the paranormal, fantasy, surrealism, mystery, and horror. At times highly realistic (it’s an amazing portrayal of teenage life in a small town) and at others feeling like poetry , it is a pleasure to read. There are no heroes or villains here, there is no clear-cut good and evil, and at the end you will be left to color the story with your own impression and experiences. There is an overall sense of possibility and the unknown, so much so that there is a lot of room for the reader to decide if the events are truly paranormal or psychological. The book begins with Chloe discovering a dead body while swimming in the town’s reservoir at night. Because of that she is sent out-of-state to live with her father, two years pass in her father’s home before Chloe see’s Ruby again. You would never know it if it wasn’t explicitly said however, because almost not time is devoted to her life without Ruby, we never get to know Chloe’s father or step-mother. I think Suma missed a great opportunity for contrast here. So much of the book is written in metaphor and simile, using allegories (Ruby’s stories) and flashbacks to describe the events that while lovely some sequences of the book are confusing and difficult to follow. Overall the book is highly original, and definitely stands out among YA’s that can often feel repetitive in theme. It had some problems, but it was still enjoyable and worth reading. If you enjoyed this book, or like genre bending, lyrical YA I recommend The Replacement by Brenna Yovanoff. I understand! I liked it, like I said, but I also think it’s something you have to be in a very specific mood for.